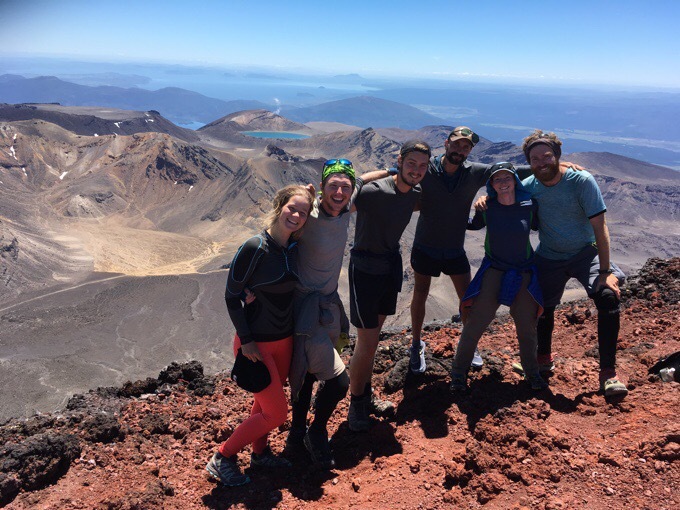 Day 44: Finally, Tongariro Crossing & Mt Doom! 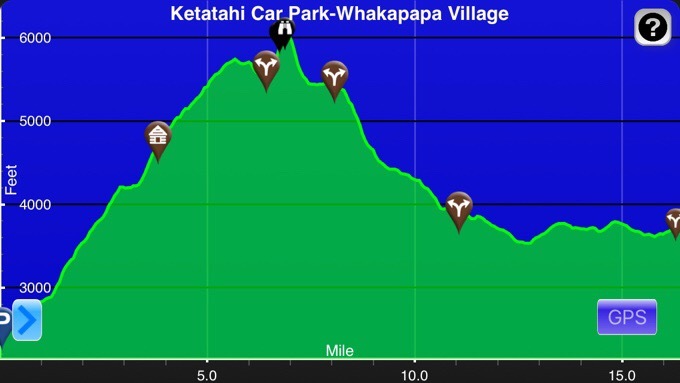 *Mileage and elevation chart do not include our Mt Doom side trip summit. Since this was a special day, this will be a picture heavy post. So many photos! We got our early start leaving the trailhead at 4:40am with headlamps on. The moon was large and bright, but it was wooded for the first hour until we broke out of tree line. We stayed for an hour to watch the sunrise and took way too many photos of the views of horizon and the lake in front of us. First glimpse of the sun. 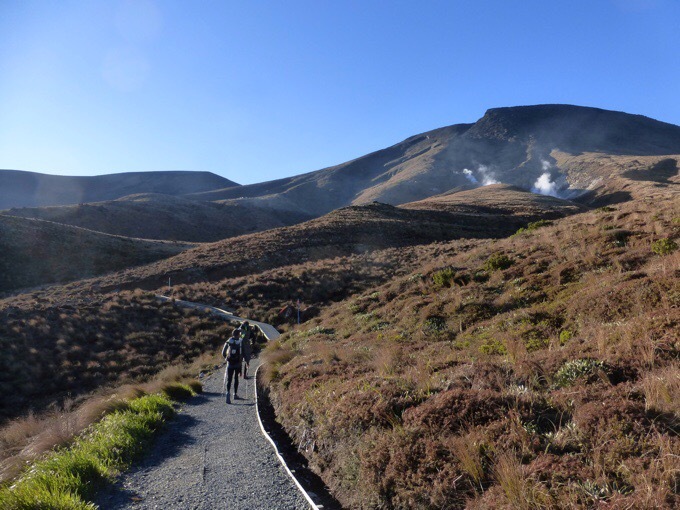 Then we continued on up with views of Tongariro Mountain and the strong smell of sulfur from active fumaroles smoking in various places. Morning light was great! We took our time today stopping to really take it in. 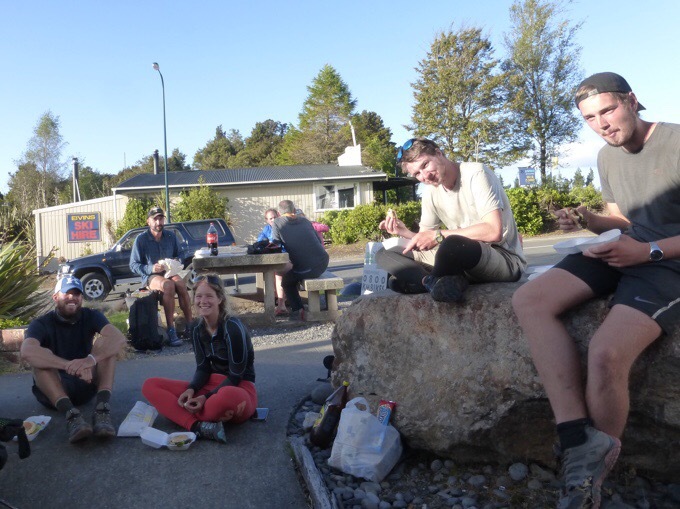 We took a break at the Katatahi Shelter, which had water and toilets, but is no longer in use due to rockfall damage from a volcanic eruption a few years ago. Weather was ideal with completely clear skies, hardly any wind at all, and warm weather. It really couldn’t be a better day to do this hike. 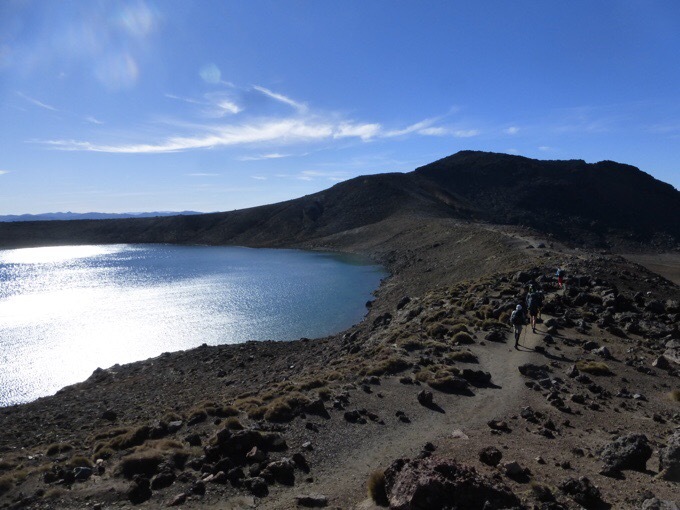 We turned to get our first view of Mt Ngauruhoe (Mt Doom in Lord of the Rings) and we walked by Blue Lake. 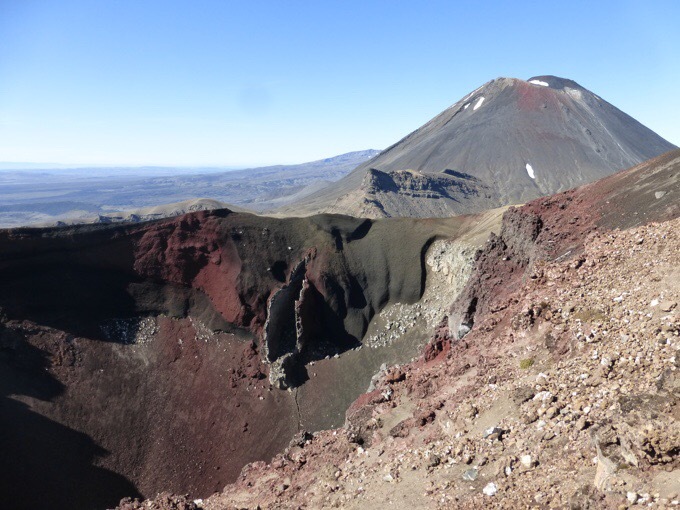 Our first view of Mt Doom/Mt Ngauruhoe in red. 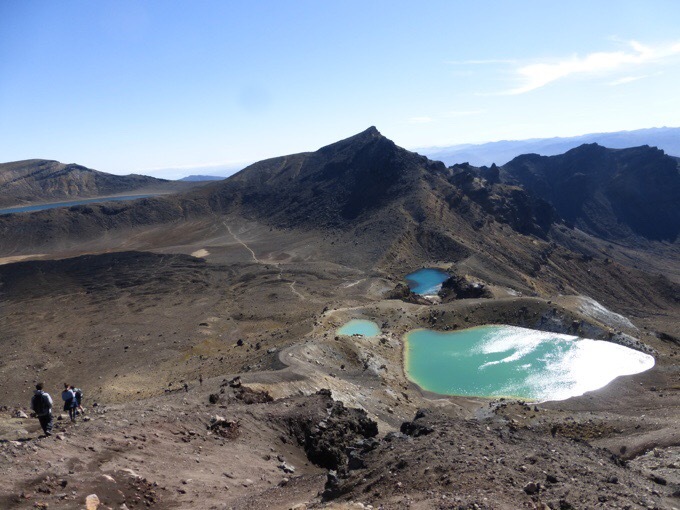 The high point of the Tongariro Crossing is at the Red Crater where there is a great view looking back on where we came and down on the Emerald Lakes with Blue Lake in the distance. 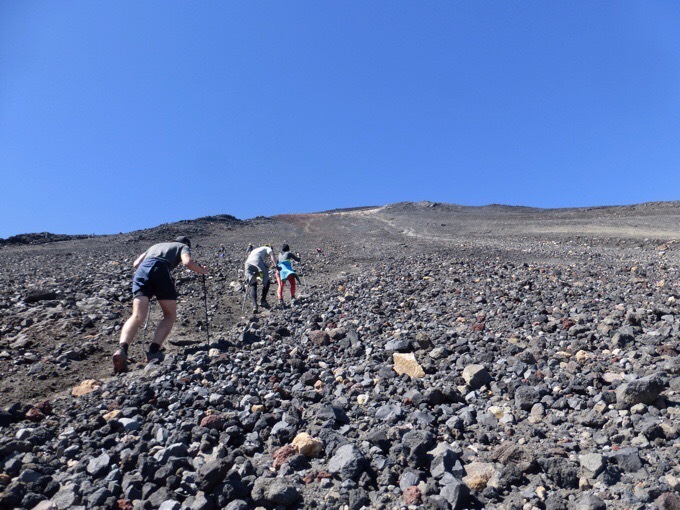 The climb up to Red Crater. 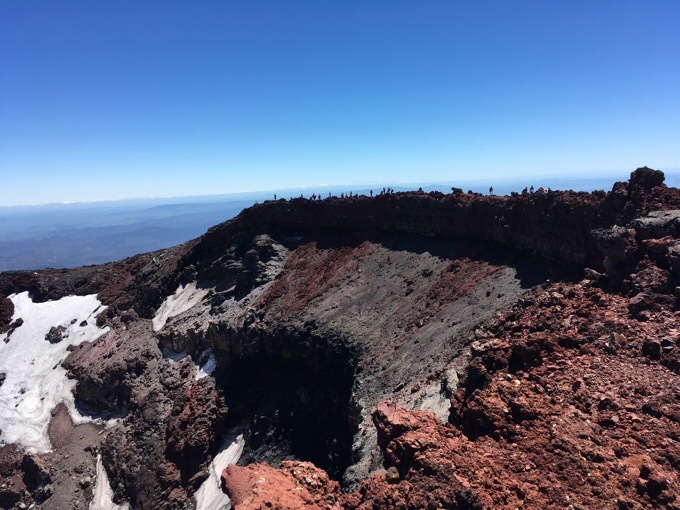 Red Crater and Mt Doom. Looking back on Emerald Lakes. The Te Araroa does this route against the flow of traffic, as hundreds go the opposite direction everyday and get picked up by shuttle at the end. It goes nobo because there is less elevation gain going that way. The crowds actually weren’t terrible compared to what I imagined. I think it helped that we went early. 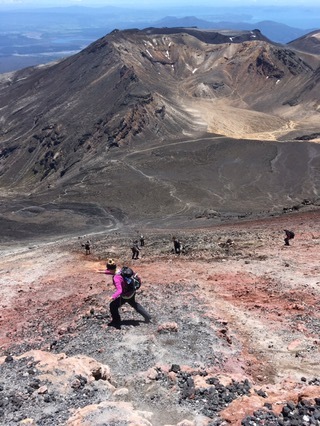 Once over the high point, we had a great view of our next challenge, Mt Doom! 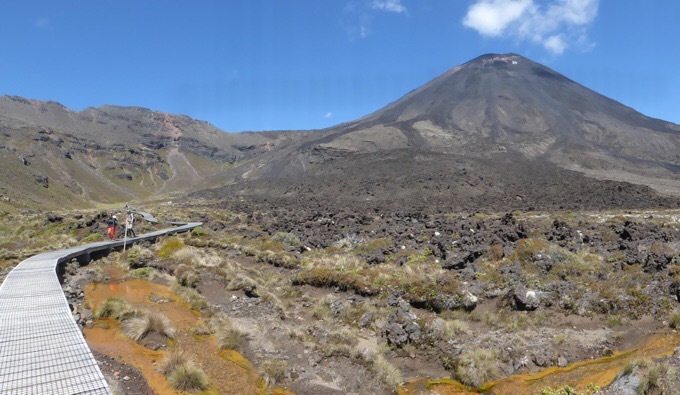 Mt Ngauruhoe is 2287m/7503ft. Yep, we’re going up that! We stashed our packs at the bottom, and climbed up with snacks and water. Fortunately, we had already climbed up a lot and only had 616m/2021ft to go. It took an hour and a half with two breaks to get to the top. Break #1 looking across to Tongariro Mtn. 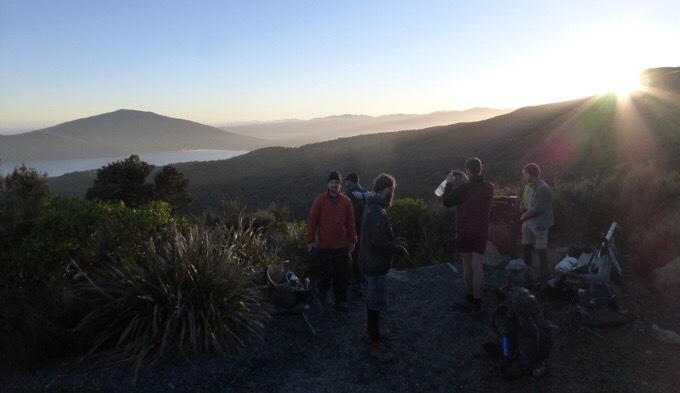 Break #2: See Blue Lake in the distance and Lake Taupo even further? The terrain was basically straight up loose lava rocks and deep dirt and scree. Slow going, but nothing too taxing. Constantly, people are yelling warnings of falling rocks as they are knocked down from climbers way above. It’s hard to believe more don’t get hurt as we saw some very intimidating rocks fly down and bounce in all different directions and heights as they gained speed. We spent about an hour on top. 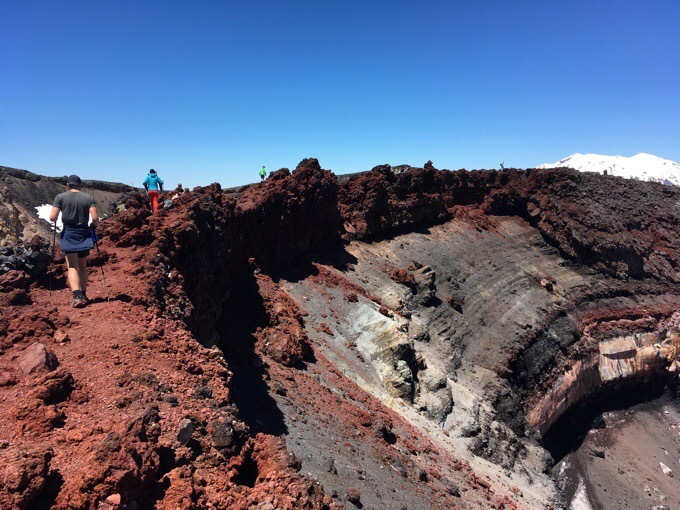 You can actually walk around the whole crater, which was pretty cool. It was a perfect day to be up there with hardly any wind and warm temps. So rare for up there and we wished we had brought lunch to have it up top. We just figured it would be cold and windy. Of course we took far too many summit photos! 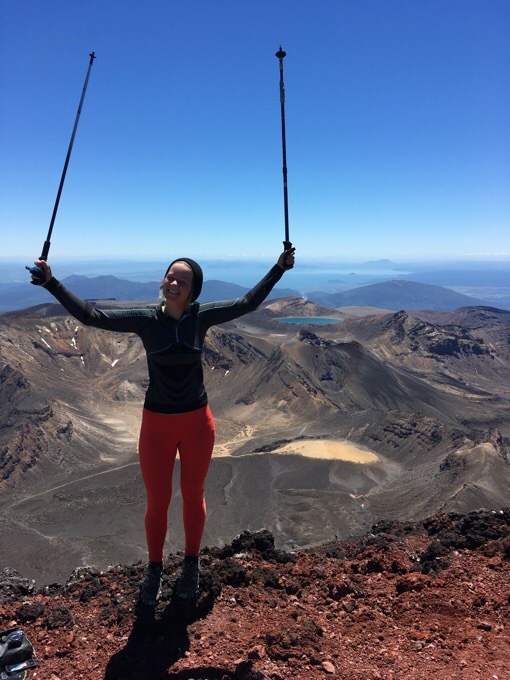 Congrats to Becky on conquering her first major mountain! The descent down is controlled chaos. 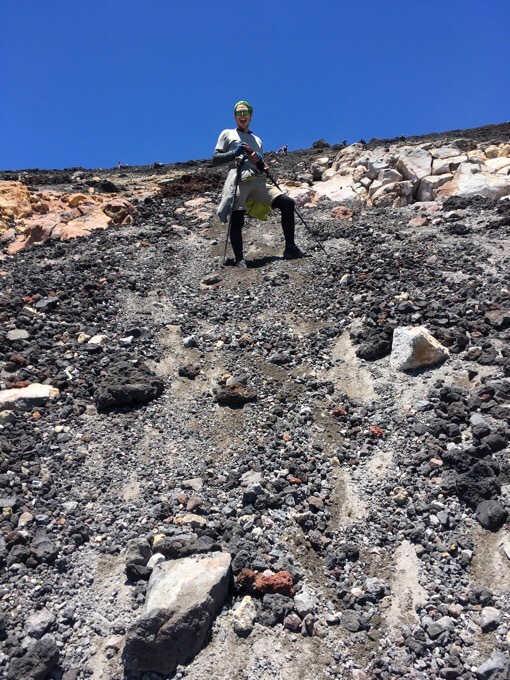 There are chutes of sandier looser scree that people basically leap/ski down. Poles make this much more fun and I flew down. There were some in the group that got some good scrapes with small falls on the volcanic rock. The photo so embodies the joy of Tom. Once at the bottom, it was quite hot and we finally had lunch. Fortunately, Felix also carries an umbrella, and let me hide under it during lunch. 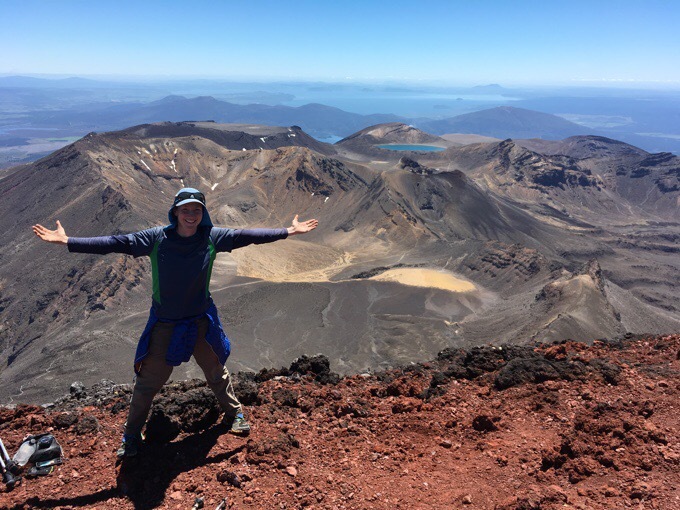 I used my dorky sun hat and tons of sunscreen after hearing how intense the sun can be along the Tongariro Crossing and Mt Doom. I have to say I’ve really been happy with my Sawyer sunscreen (yes they make more than water filters!). It’s pricey, but a small bit goes a long way. I can have a small 2oz tube last over a week out here, and I apply it 2-3 times a day. The final 9mi/14km was the killer. It was longer than we all expected and the sun was quite hot. 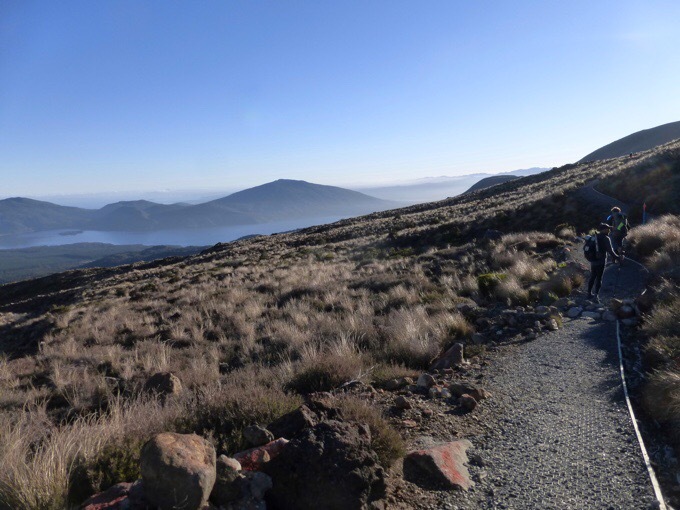 The first 3mi/5km stretch to the Mangatepopo Hut had a nice boardwalk and steps as it is where the majority of people start the Crossing. 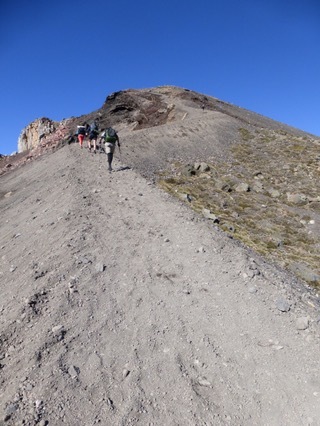 Since we spent so much time on the Mt Doom side trip, we had the whole descent with no crowds. It was awesome to have such a busy place be calm and quiet. After the hut, of course the quality of the trail greatly diminished. I was too spent and frustrated to properly document it, but the last two hours were spent in a mud gulley that was slow going with more up than down it seemed. We had hoped for a downhill cruise. I didn’t get a shot to properly depict the trench we were in. Slow going and we were drained. To future TA hikers, this is a draining day to do the whole Crossing to Whakapapa and the Mt Doom side summit. 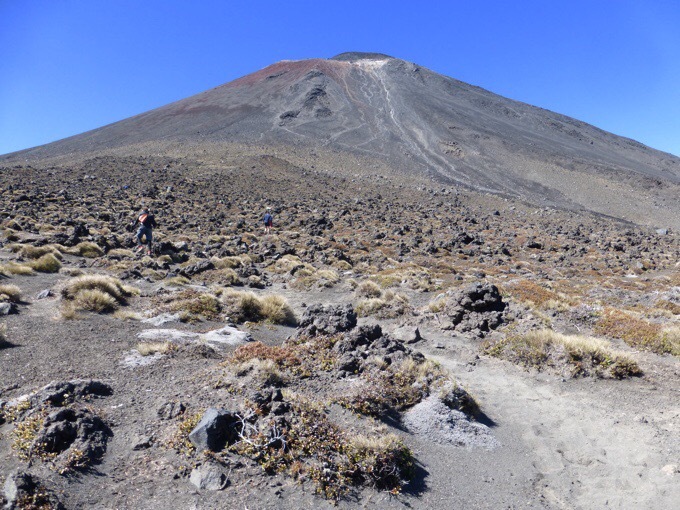 Many TA hikers seem to not do it all, slack pack it, and skip this last section from Mangatepopo Hut to Whakapapa Village. Clouds came in as we finished the day. Perfect timing! We hit the road at Whakapapa Village just before 6pm, making it a tiring, but very fulfilling 13hr day. 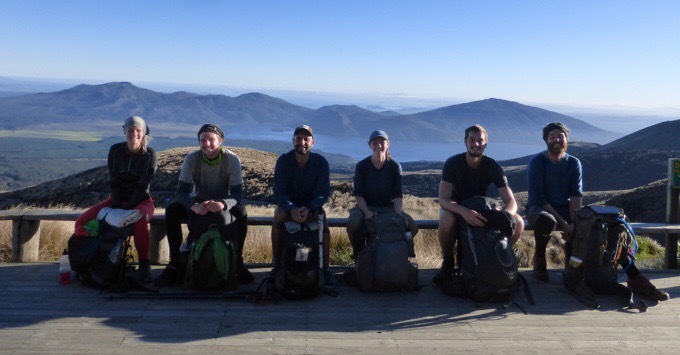 It took a bit to get two hitches to National Park (we hiked the 20km section from Whakapapa Village to National Park yesterday), and we made it about 20mins before the Four Square and takeaway closed. We were able to get snacks at the Four Square and all rewarded ourselves with burgers and fries. Will even showed up at the end and ate with us. 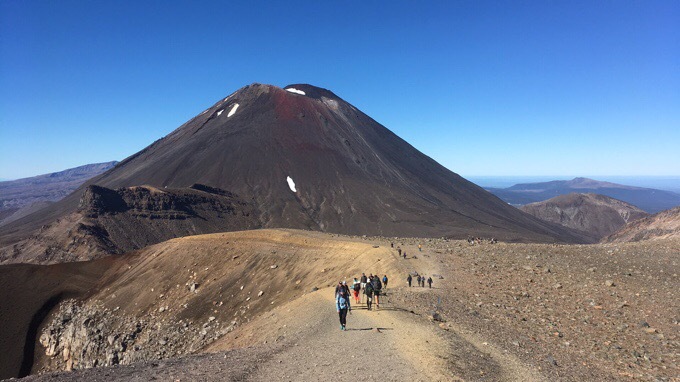 With this day being so perfect, many TA hikers hitched over from wherever they were on trail to do the Tongariro Crossing today. I felt like we were seeing TA hikers everywhere, and it was like a reunion with all the past hikers we’ve met. It was nice to get a day with Felix too. 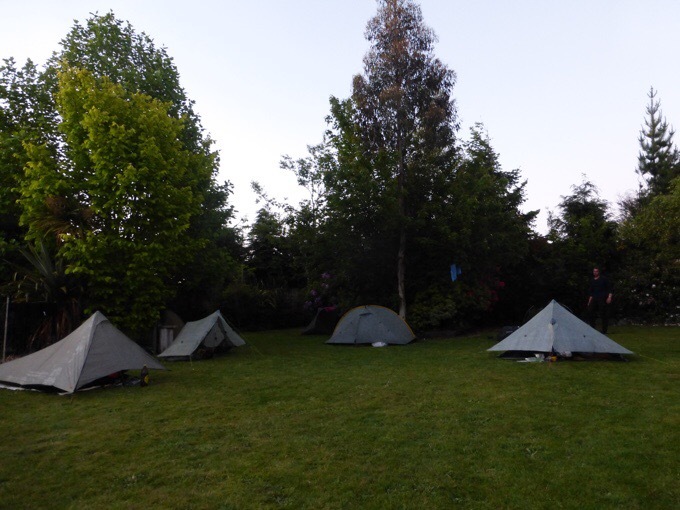 We are tenting ($15NZ/$11US) at the YHA hostel in National Park, and it’s packed on a Saturday night with tourists and TA hikers. Great wifi (for a price), and I’m happy to be able to upload all these photos. 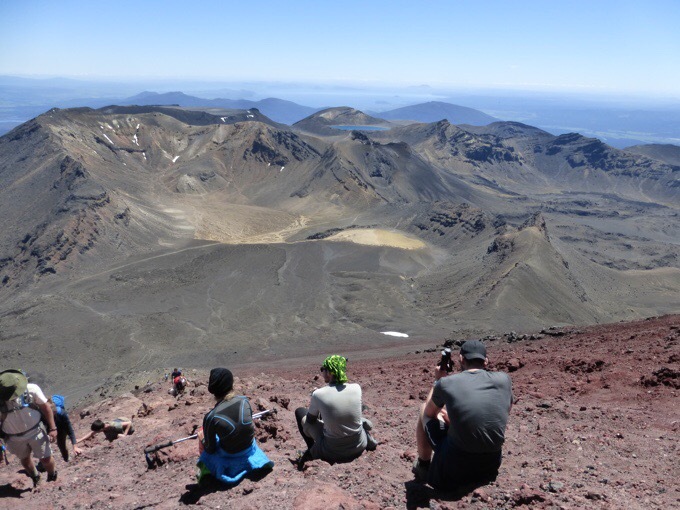 All day today, I went back and forth on wanting to do the 10hr+ hike tomorrow that would complete the Northern Circuit around Mt Tongariro. Felix and Will did it yesterday and really enjoyed it. If we did it tomorrow, it would mean we’d have to do a pretty big day the next day to still make our canoe launch day for the upcoming stretch on the Whanganui River in a couple days (I’ll explain that more tomorrow). This day was quite tiring, so we decided not to push it. I’m spent, and squeezing that in would have required a rushed turn around. We won’t hit town for a week once we leave National Park, and just getting resupplied, blog posts, showered, emails, and charging things will take time. I’d rather do that all leisurely than rushed. Plus, I want to watch the Survivor finale! Sad, but true. This leg did have short days, but the cold wet weather takes a toll. 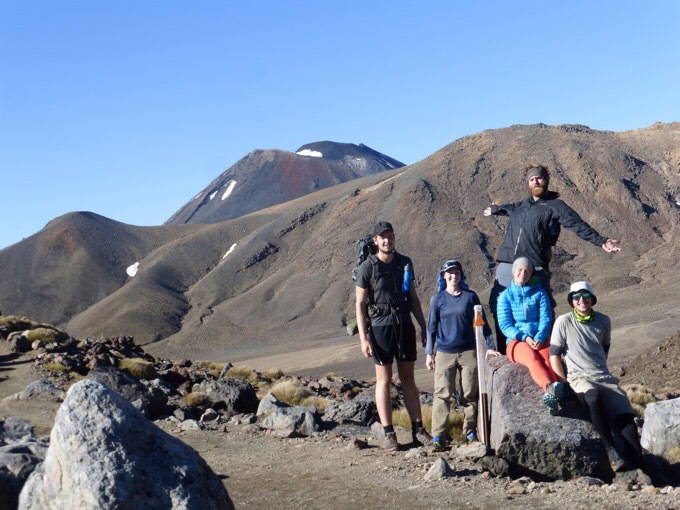 The rest will be welcomed:) All of it was worth it to get such an ideal day for the Tongariro Crossing and Mt Doom! Looking forward to hearing about the canoe section coming up, intrigued how that works. Now that’s MY kind of hiking (although I must say all the roots and mud in the forests remind me so much of Hawaii)!!! What an amazing day you had! I’d be happy to lose my umbrella for a cloudless, windless, warm crossing and ascent of Mt. Doom! Go Erin! Favorite photo has to be the one with Red Crater and Mt Doom, but a lot of awesome ones. What a fantastic day, so different from everything else you’ve experienced in NZ. And you know Felix is UL carrying Handy Andy’s awesome Pa’lante Pack. Yes, he’s by far the lightest one out here! 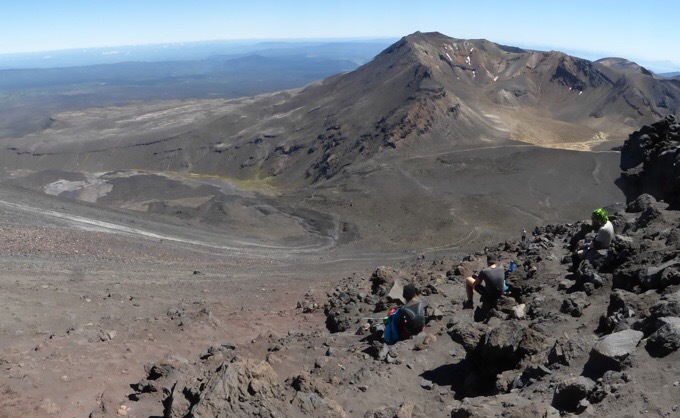 Ruapehu is 2797 m, but people often get fooled by the steepness of Ngauruhoe, it makes it look taller since Ruapehu is a much broader mountain. Good to know! I was misinformed. Fixed it. Did you find the ring?? We missed the crossing twice due to weather. Sorry we missed it, looks spectacular. Oh man, my sister missed it when she came here for her honeymoon. You state that Mt. 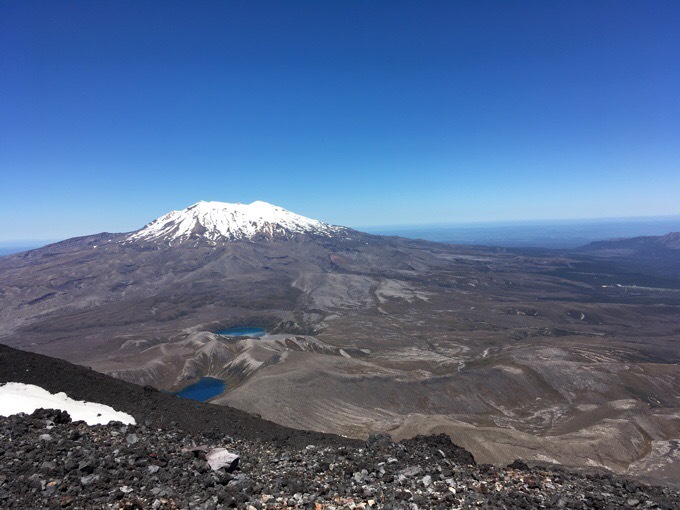 Ngauruhoe at 7503 ft. is the tallest mountain on the North Island. In two of your photos you show Mt. 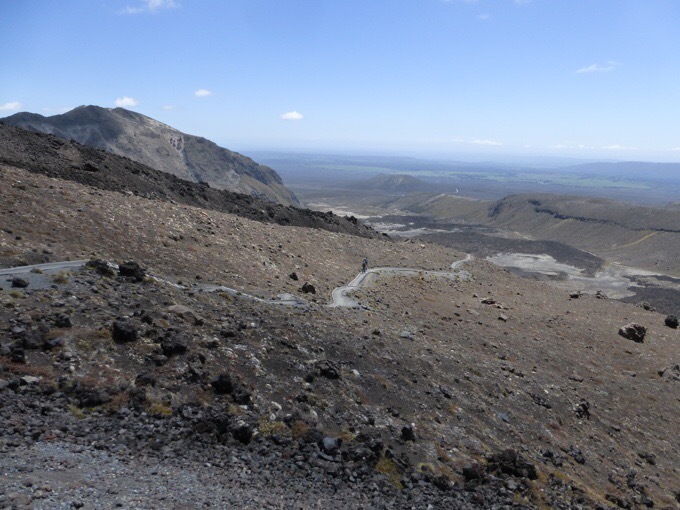 Ruapehu which is also on the North Island and is 9177 ft. 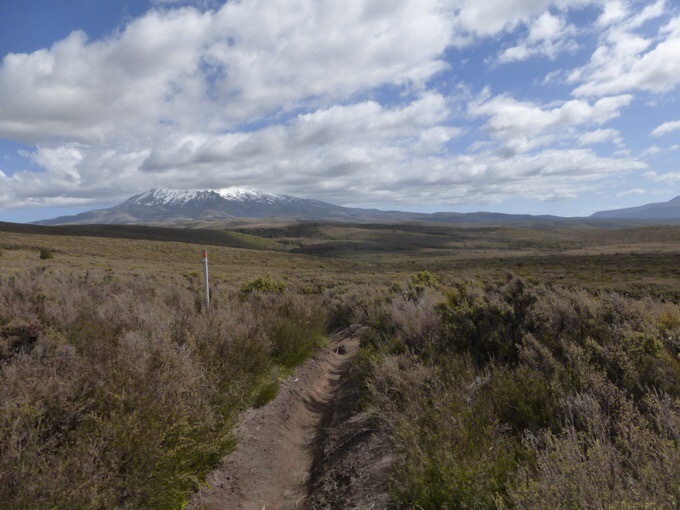 It would make sense that Ruapehu is taller since it has snow in the photo. Yep, I was misinformed and fixed it, thanks! Wow, loved that you were in so many photos. That is so not the norm but it is great to see you smiling and exuberant! Congrats to you and all that participated. A lot of planning and hard work went into this day but it appears perfect. Good for you for not overpushing your body to do that 10+hr day. You are going with the flow, that’s so rad! Congrats Becky on the first big climb! You are in big company. Amazing day, group, pictures.. did Becky leave the ring up there? Also love that you got a glimpse of Lake Taupo.. I have heard about that lake and area and it sounds wonderful. Hoping the water passage goes well and that you might be reunited with your umbrella ? or a replacement. Hard to imagine anything offensive! As a desert rat, myself, it was fun to see the volcanic rock and the red rock and no trees to speak of for a change! (And no rain or mud!) Looks spectacular!